Welcome to another Lazy Sundayin France, where today I have a tasty treat lined up for you. I lost an hour of my precious sleep last night, and even if the reason does now mean we are on Central European Summer Time, something sweet from the village boulangerie was just what I needed today, to keep my energy levels up. As luck would have it, today is Palm Sunday, or Rameaux in French, the last Sunday in Lent and in our area that means la cornuelle, a Charentais speciality made by boulangers, just for today. In terms of food, fun and French culture, it has to be one of my favourite days and I still can’t believe it took me 11 years to discover it. 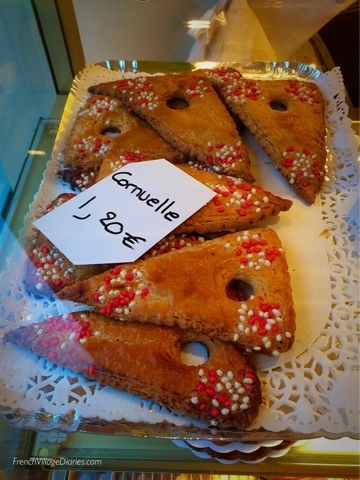 La cornuelle is a triangle shaped buttery biscuit, with fluted edges and a hole in the middle, that is decorated with aniseed sweets. The triangular shape represents The Father, The Son and The Holy Spirit and traditionally it was sold at the entrance to church on Palm Sunday, where a sprig of box (another traditional French symbol of Palm Sunday) would have been placed in the hole. However, a few years ago a puff pastry version appeared at our boulangerie, deliciously filled with strawberries and whipped cream, so I couldn’t wait to see what would be on offer this year. It was with much excitement that Pierrette, my French neighbour, and I made our Sunday morning pilgrimage to the boulangerie and I spied the tray of decorated biscuits with relief. We chatted with Bernadette (madame la boulangère) about the French Palm Sunday and Easter traditions and then the other story behind this Easter treat, dating back to the Middle Ages, came up. For those whose beliefs are more Pagan than Christian, and with spring signifying new life, la cornuelle is believed to be triangle shaped to represent the female reproductive organs and is a sign of fertility. This tickled the three of us, two middle-aged mothers and a sprightly just-turned 78-year-old, no end, before Pierrette and I pretty much cleared her out of cornuelles. I do hope she had another tray out back as there is no way Pierrette or I can do much to increase the population of the village at our ages. On that, I shall leave you to enjoy your Sunday while I pour myself a coffee and enjoy my lady-garden biscuit cornuelle. If you would like to be involved in a future #LazySundayinFrance post, maybe you are a writer, a blogger or run an independent business in France and have something you think would be ideal to be included, please do get in touch.